Purchasing a fence is not an easy task. Most people only do it a few of times in their lifetime and often find it difficult to get straight forward, unbiased advice on the topic. In this area, we simply explain fencing without the sales pitch. We explain fencing the way we would if we were helping a friend with their decision. There are many reasons to buy a fence including protection, beauty, privacy, defining boundaries, accenting surroundings, and keeping children in or dogs out (or vice versa). Choose from a range of styles and designs, in addition to a variety of materials and quality grades. When considering the cost of a fence, think about how long you want it to last and how much maintenance it requires. Also consider zoning laws and neighbors before making your final decision. Ask yourself how long you will be living in your house, as well as, whether you mind maintaining your property or prefer to pay someone else to do it. A quality product will help to avoid future maintenance costs or can add value to your home. 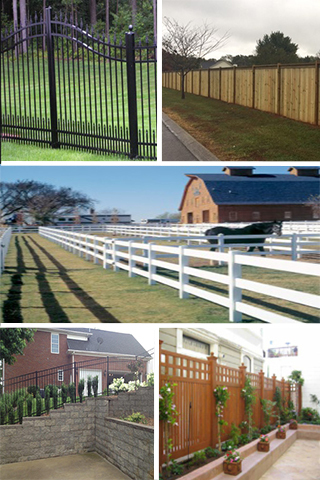 The answers to questions such as these can point you to the best fence that’s right for you. CHAIN-LINK – Defines boundaries, and controls the flow of traffic at an exceptional value. A perfect foundation for hedges and vines. VINYL – Virtually maintenance-free, available in styles similar to wood or aluminum. WOOD – Versatile design options to accent the surroundings. The warmth and beauty of natural wood can be well worth the added maintenance. POOL FENCING – Protect your loved ones, your pets, and add a touch of beauty to your pool area by adding pool fencing.